Game gets more challenging as you progress. 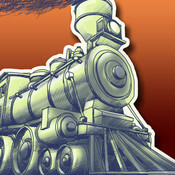 If you like controlling trains with a puzzle and arcade element, you'll like this one. Very fun, simple to grasp and not too hard. I also enjoy the graphics, I find them very innovative.